A parade through South Bend was part of the LHA conference last Friday. Here are some photos after the group left the overnight stop at a fairgrounds; some of the vehicles were awaiting repair such as the first one below. The Transcontinental Motor Convoy of 1919 was a project of the Army’s Motor Transport Corps. The group decided to organize a military convoy to drive from coast to coast, from Washington D.C. to San Francisco, traversing the newly created Lincoln National Highway, conceived just seven years earlier. It took 62 days to travel 3,251 miles, averaging a little more than 50 miles per day, to cross from Washington, D.C. to San Francisco, Calif. It is best known today for Dwight Eisenhower being one of its young officers. The MVPA is anticipating the 2009 trek across the U.S. to take 26 days. For more information, visit www.mvpa.org/. I spent Monday driving across Ohio and Indiana, heading to the annual Lincoln Highway Assn. conference in South Bend. I followed many old stretches of the LH and took many photos — so many that the 6 hour trip took me 14 hours. my camera is overloaded, its batteries are dead, and my head is kinda hurting but it was a great time, I got great photos, and met some very nice people. Here are some photos from the trip. Attendees to the 2009 LHA conference in South Bend, Indiana, are looking forward to meeting authors and artists on June 18th. 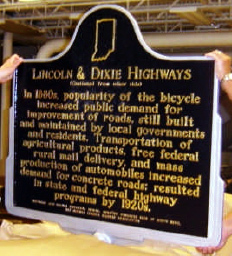 If your work focuses on the Lincoln Highway or Dixie Highway, please contact Jan Shupert-Arick at (260) 452-8140 and ask to be part of the authors and artists celebration. There is no charge to participate — bring your books/artwork and a table covering. The public is also invited to meet the authors and artists. Roadside artists, authors, and photographers are wanted for the 2009 Lincoln Highway Association Conference in South Bend, Indiana, June 15-20, 2009. A reception will offer an easily accessible place for the public and LHA members to meet those who create the works. Imagery and books are especially encouraged that relate to the Lincoln and Dixie highways. The conference will feature an author and artist public reception on Thursday, June 18, at the South Bend Century Center, where products will be for sale. Authors can reserve a table to display and sell books but there’s limited space to display artwork and photos in the vendor room and reception area at the host hotel Holiday Inn. Click HERE for the entry form and look for updates at at www.indianalincolnhighway.com/. The above image is by Mary Ann Michna. The Indiana LHA launched its new website www.indianalincolnhighway.com featuring a state map, recent newsletters, info on the June 2009 conference in South Bend, and tons of links. A story in Thursday’s South Bend Tribune recalled the Lincoln Highway across Indiana and discussed plans for the 2009 LHA conference in South Bend next June. On the evening of Oct. 31, 1913, some 3,000 people and 500 automobiles paraded from to Springbrook Park in South Bend. There, in the park that later became Playland Park and is now property owned by Indiana University South Bend, a huge bonfire was set ablaze — the flames could be seen for 20 miles. It burned simultaneously in a line of bonfires across the country from New York to San Francisco. For miles across Indiana, farmers lit Jack-0-Lanterns on fence posts. It wasn’t to drive witches out on Halloween. Instead, the “monster parade,” according to The Tribune, celebrated the dedication of Lincoln Highway, America’s first transcontinental highway. The LHA conference is set for June 16-20, 2009, headquartered at Century Center, South Bend.